Rwanda’s traditional `Gacaca’ courts, set up in 2001 to try some of those responsible for the 1994 genocide and to decongest the prison system, wind up on 30 June, but questions remain as to how much they achieved. Gacaca courts have tried at least 1.5 million cases (with about 4,000 pending). However, at least 100 genocide survivors, have been killed - most of them after testifying against suspects in these courts, according to the umbrella organization for survivors, IBUKA. "Most [survivors] who have testified in these courts are traumatized because genocide suspects and convicts single them out for revenge," said Theodore Simburudari, president of IBUKA. Gacaca means “grass”, and trials are designed to take place in the open, where survivors point to suspects. This makes them vulnerable to reprisal attacks, Simburudari added. Busingye Deus, a small-scale trader in Kigali, told IRIN that his friend, Ramadan Uzabukiriho, died in March in suspicious circumstances. Uzabukiriho, a genocide survivor whose parents died in 1994, was killed shortly after testifying in one of the courts. "I am sure he would still be alive if he had not testified," Busingye said. Uzabukiriho's attacker is awaiting trial, according to IBUKA. Attacks targeting suspected `genocidaires’ have also been recorded, and rights groups warn this could fuel ethnic tension. In one incident reported by the New York-based Human Rights Watch, genocide survivor Frederic Murasira was killed near Mugatwa in eastern Rwanda. Hours after the attack, genocide survivors in a nearby village killed eight Mugatwa residents who had apparently played no role in Murasira's murder. On the plus side, according to legal experts, the courts have managed to extract the truth from prisoners, enabling survivors to know exactly what happened to their loved ones. Rwanda’s National Commission for the Fight Against Genocide is compiling data to highlight the system's achievements, said Kanimba Misango, the commission's president. Pending cases will revert to the conventional courts. "Courts with outstanding cases will be given up to the end of the year to wind them up, otherwise, most of them close at the end of this month," Misango told IRIN. Aid organizations have hailed the Gacaca system for reducing prison congestion through non-custodial sentences. The government has also so far released over 1,400 prisoners, requiring that they do community work instead of being locked up. Despite its success in speeding up trials, the lack of legal representation and formally-trained judges has been pointed out as a weakness of the system. “Lack of legal representation denies defendants a fair trial, [and] as legal practitioners, we should have addressed these gaps when the system was being introduced," a Kigali-based lawyer, who declined to be named, told IRIN, adding: "However, we have to also accept that at that time, there was a gross shortage of resources, both financial and physical." 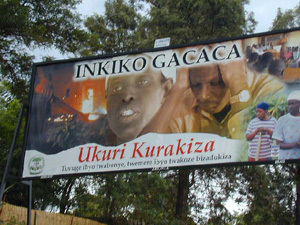 [Rwanda] Billboard in Kigali calls people to take part in the Gacaca courts. "If you tell the truth you can be forgiven or the punishment is reduced." In 2008, HRW expressed concern that the system denied defendants the opportunity to a professional defence. It has also in the past pointed out numerous instances of faulty procedure, judicial corruption and false accusations, something which undermines trust in the system's jurisdiction. The Gacaca courts have tried cases involving rapists, those who killed or intended to kill and their accomplices, as well as torture, incitement and property-related cases, while high level leaders and genocide organizers are tried in conventional courts. Legal experts also say that instead of reconciling people - one of the courts' mandates - most genocide convicts reject reconciliation and restorative justice and resort to a retributive approach, a position echoed by IBUKA. Also, it has been difficult for sexual violence survivors to testify as there were no provisions for in-camera proceedings, meaning such crimes often went unreported. Each year the government dedicates a week to commemorate genocide victims, but in the past few years the week has seen an increasing number of attacks on individual survivors, according to the police.